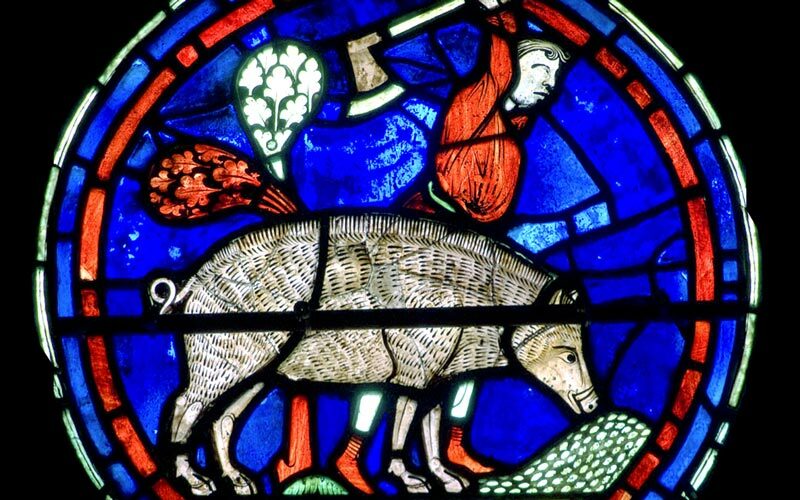 The Chartres November window presents the labor of fattening boar with acorn for imminent slaughter. However, other tasks derive from the symbols featured here, preparations that must also occur as our farmer approaches the barren period of the year. Fattening the boar suggests gathering fodder for livestock. The axe suggests hewing logs for firewood. And acorns suggest seeds for sowing. These are all labors that are featured in other medieval representations of November. We studied the symbolic meaning of fodder during hay harvest in June. We studied the symbolic meaning of firewood during February. Let us focus our November labor on the aspect that is yet to be addressed, the labor of sowing. Now would be the time to sow wheat for a June harvest. Wheat sown now will push root before the ground freezes, lay dormant through winter, and mature after warmth returns in spring. This calculated dormancy is one of the main features of a seed. It can synchronize its germination with the optimal conditions to survive the cold months of winter. Moreover, most seeds are endowed with a much longer viability period than a single winter. If they encounter even years of drought or cold, they can wait patiently till the next optimal conditions present themselves. A seed of wheat can last for hundreds of years without losing its viability. It encapsulates the essence of its parent into a small and durable abbreviation that can withstand the unexpected. So how do we encapsulate our inner harvests into small and durable abbreviations that can withstand the unexpected? The first step is to review those harvests. What were our most important verifications around movement and physical sensations during the May and June labors? What were our most important verifications around thought patterns during the July and August labors? And what were our most important verifications around emotions during the September and October labors? How much better would we govern ourselves if we could recall those verifications to mind by snapping our fingers at the moment of trial! How much better could we resist the urge to hurry if we had our verifications around haste at the tip of our fingers, or curb the urge to daydream if we had our verifications around imagination at our hand’s reach, or struggle with negativity if we had our verifications around emotions up our sleeve! Our habits always manifest unexpectedly and in the immediacy of the moment. Negativity slams our door open unannounced, It doesn’t leave us time to run to our library, find The Fourth Way on the bookshelf, look up Negative Emotions in its index, and read up on the methods of non-expression. We must act now, rush to the other side of the tug rope and pull against the sense of injustice, the conviction of entitlement, the illusion of being right — or whatever else permits our urge to vent anger. If we could recall — whilst in the eye of the storm — everything we’ve ever verified and suffered about negativity, these recollections would infuse our efforts with invaluable instruction and inspiration. So after reviewing our verifications around this year’s harvests, the second step of the November labor is to formulate a set of commands that abbreviates them — monosyllabic commands, if we’re to follow the advice of The Cloud of Unknowing. These syllables will will be the seeds of our harvest. If you are new to this teaching, focus exclusively on assigning the word ‘Be’ to your efforts to self-remember. Each time you try to remember yourself, silently intone the command ‘Be’ in an attempt to marry this name with its corresponding state. At first, this might seem unnecessarily intellectual, but through time and repetition you will witness this monosyllabic word becoming “your shield and spear, in peace or in war.” If you have experience with this teaching and have applied this technique before, practice assigning monosyllabic commands to each of the three primary harvests of this year: one command for working with physical habits, another for working with intellectual habits, and a third for working with emotional habits. Restrict yourself to three; too many commands will drown your work in thought and miss the purpose of the November labor. Share your commands, and your attempts to apply them, in the commentary below.